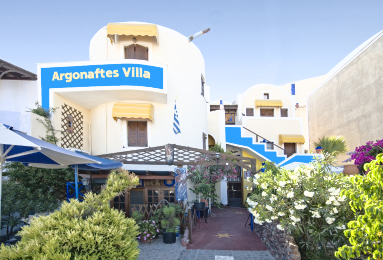 Argonaftes Villa is a guesthouse (small accommodation facility with a three �Keys� Rating) owned and operated by the Koronios family. Carefully tended plants and arbors make the patio an oasis where guests can enjoy breakfast or relax later in the day. Toula Koroniou offers her guests traditional Greek hospitality, giving tips on sites to visit, current cultural events and information about the island. At the reception desk, Manolis and Efi, the son and the daughter of the owner are always happy to provide you with a variety of touristic information on bus and ferry-boat schedules, organized local tours to archeological sites and wineries, boat trips to the volcano island in the caldera as well as on many other activities. They can also arrange for you a plethora of services delivered by professionals and spanning from travel agency services (boat/air tickets), car/motorbike rentals and taxi appointments to hair styling and personal grooming appointments. Each unit in the guesthouse is comfortably furnished with private bath, air-conditioning, refrigerator, television, nightstand and a wardrobe. Furthermore, the standard equipment of rooms includes a hairdryer, always handy for travelers, as well as an electric kettle, a pair of mugs and some basic utensils that will ease the preparation of your coffee/tea or even of your own breakfast/snack. Free wireless Internet access is available in all private and public areas of the guesthouse making communication with your family, friends and social network an easy task. An additional feature that you may find convenience during your stay is the free public parking available right next to the property. Convenience Stores, Restaurants, Cafes, Car/Moto Rentals, Stores etc. Electric Kettle, Mugs, Teaspoons etc. 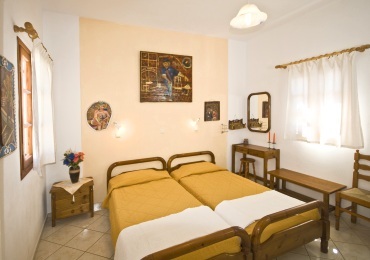 Argonaftes Villa has six double rooms as well as one apartment that can accommodate up to three people. Almost all the rooms face to the east, affording a view of the eastern side of the island, sloping down to the sea. All except one of the double rooms have a private balcony; and two of the double rooms are located in a round tower, modeled after traditional windmills. 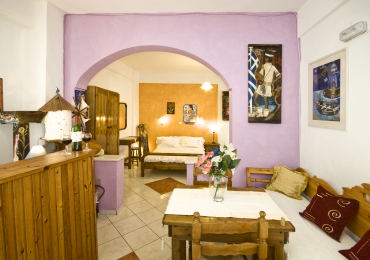 The apartment of the guesthouse has a bedroom, a dinning area, a kitchenette and a private balcony. The bedroom is equipped with one double and one twin bed (placed in the same room) whereas the kitchenette is a separate room in the apartment. 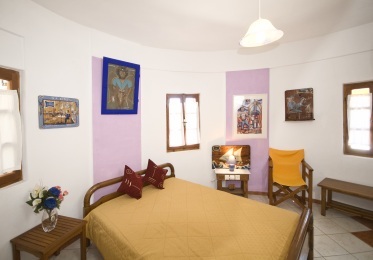 Nevertheless, a feature in common for all rooms in the guesthouse is their decoration with Lefteris' distinctive expressionist paintings. Located in Firostefani, at the northern edge of Santorini's main town, Fira, Argonaftes Villa is a five minute walk from the central square (downtown), the Orthodox and Catholic Cathedrals, the Archaelogical Museum and the Nomikos Conference Center that houses the famous "Wall Paintings of Thira" Exhibition. Nearby public transportation, taxis and shops which rent cars or mopeds make this a convenient location for exploring the whole island. 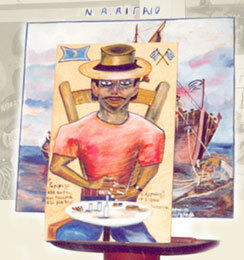 Restaurants, cafes, convenience stores (mini-markets), souvenir shops and other museums are close by. Nightlife is walking distance away, so the villa is quiet at night. The caldera walkway, with a view of the volcano, is just up the hill from Argonaftes Villa, as is the Nomikos Conference Center. Please contact us for more information or to make a reservation. We look forward to hearing from you.